The demand for stylish and effective sun hats for men has increased as more outdoor activities involve exposure to the sun. There are several ways to both look good and protect yourself from harmful UV rays. All sun hats have the same purpose: to block harmful sun rays from your head, face, neck and shoulders. There are many styles to choose from, most named after the area of the world where they originated. 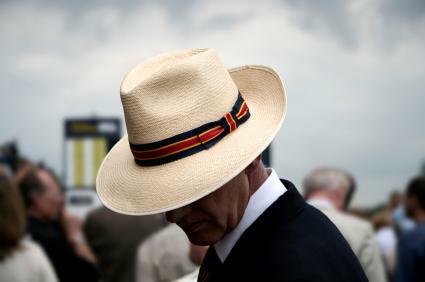 For example, the famous Panama hat has a brim that is about five inches wide and is usually made out of straw. On the other hand, the Bora-Bora booney hat from Columbia Sportwear has only a three inch brim, and is made out of nylon/polyester fabric. It's important to think about where you're going to be using the sun hat and how long you're going to be there when you're picking out your headgear. The longer you are out in the sun, the more width you're going to need in order to block the sun longer. Keep in mind that it will always shine on your face and neck for a time during sunrise or sunset, so sunscreen is needed even if you have a huge El Ranchero Style hat. While straw hats are very common and inexpensive, canvas and cotton are also good materials for sun hats because of their breathable quality. The "Charter" style sun hat has more of a canvas look to it, with mesh slits to provide extra ventilation. Hats in the Belfry doesn't have the extremely wide-brimmed sun hats for men but does borrow from many classic styles. For example, the Expedition is modeled after the Australian Outback hats worn by drovers, while the Seneca has a "downturn" brim modeled after the hat worn by Sean Connery in the Indian Jones movie. The Stetson Airway is more reminiscent of an African hunter, but includes the more high-tech element of a mesh crown. If style is not your primary concern, there are several designs for outdoor hats that include sun protection along with other features. REI's collection of hats include many that convert between "cap" style hats (with a brim only in the front) to full-protection with add-on "capes". This trend leads to styles such as the Sahara Cadet, which is reminiscent of the French Foreign Legion. You can also find similar hats on many bargain internet sites such as Mountain Gear. Hats are often on sale for as low as half price. While you're taking a risk that the hat won't fit, most online sites include a hassle-free return policy. According to the WebMD, prolonged exposure to the sun may cause melanomas, carcinomas, brown spots, wrinkles, and other kinds of "sun damage." It just makes sense to add a little style to your summer wardrobe and protect yourself at the same time. Pick out the right sun hat for you and go enjoy the summer with confidence!